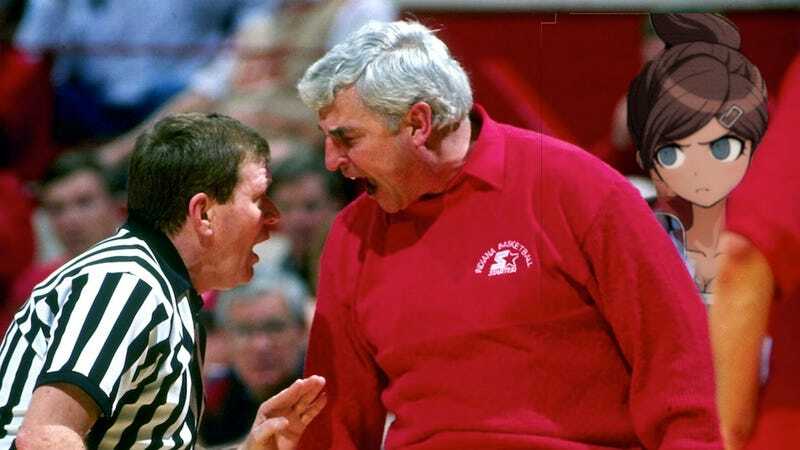 I grew up in Bloomington, Indiana, and Bobby Knight has been a small part of my life for as long as I can remember. I don't think about the guy much any more, but every now and then, the red-sweatered shouter turns up in an unexpected place. That said, he has perhaps never turned up somewhere this unexpected. I spent much of the last weekend playing the Japanese visual-novel-style mystery game Danganronpa: Trigger Happy Havoc. (I liked the game quite a bit.) In Danganronpa, a group of high school students are sequestered in a nightmarish high school and forced into a deadly killing game where only those who murder other students will be allowed to leave. The cast is a colorful bunch, and each student has an "ultimate" specialty: There's a kid who's the ultimate affluent bloodline, one who's the ultimate martial artist, another who's the ultimate motorcycle gang leader. And then there's Aoi Asahina, the ultimate swimming pro. Goes to show, even all these years since he left IU, Coach Knight's influence has spread to the farthest fictional worlds. I'm surprised none of the students in Danganronpa tried to kill one of their classmates with a chair.